A relatively-new (and remarkably-successful) division of this legendary name in hotels is the Marriott Vacation Club… a progressive timeshare concept tying together 43 resorts in 21 destinations worldwide. 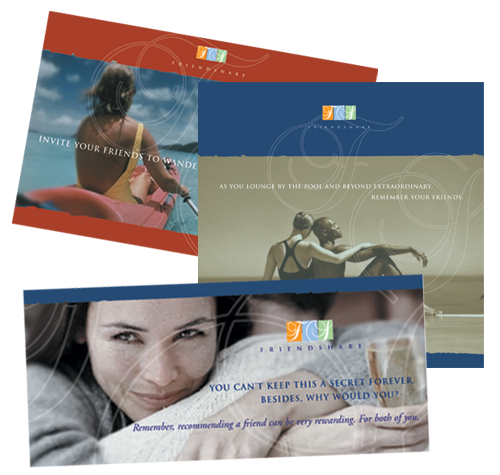 Shirley/Hutchinson was commissioned to create a variety of multi-part, coordinated direct-mail programs to generate potential-owner traffic to these resorts. An integral part of the letters and brochures that resulted was demographic specificity. In other words, a mailing sent to you would demonstrate a clear understanding of who you were, what you were interested in, and which specific Marriott destination would be of primary interest to you. This makes all the advertising personal instead of generic, and the difference in impact is difficult to over-state. By inventing concepts that played specifically to different audiences, Shirley/Hutchinson positioned the Marriott Vacation Club as a savvy provider of custom-fitted getaways. And that’s the next great step in advertising. Removing the “face-in-the-crowd” stigma that plagues so much old-fashioned work and, instead, selling to individuals individually.